The Stable Slope Selector improves upon the behavior of the default Slope Selector. Slope selections are very sensitive to noise in the heightfield. 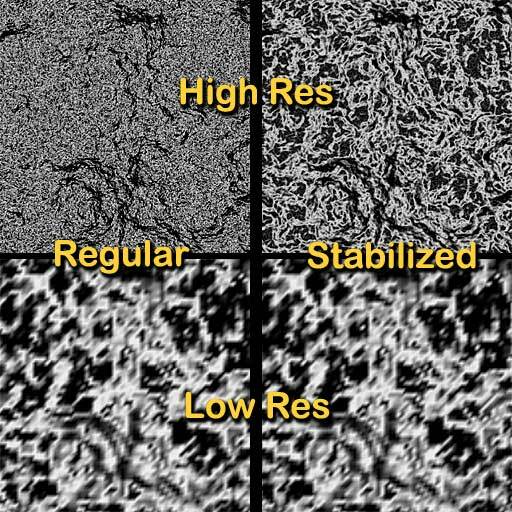 An area that is gently sloping in a low-resolution heightfield may well be rough and irregular in a high resolution one. This is a common occurrence with fractal-based heightfields which are noisy at fine scales. The example image shows this: The normal selector yields a totally different looking mask using a high resolution build than a low res one. This selector smooths the heightfield before the selection, making it more consistent regardless of the resolution of the build.